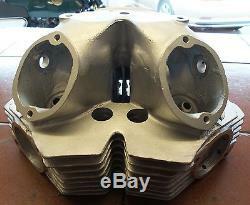 CYLINDER HEAD FOR NORTON DOMINATOR 650SS CONVERTED TO FLANGE FITTING EXHAUST PIPES BOAT SHAPED COMBUSTION CHAMBERS. 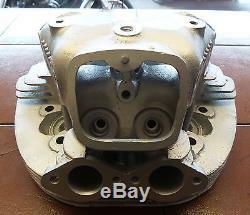 The head is a Norvil race head use on our low boy and raced by Stuart Noble to beat the Manxes. It has cast iron guides because they never wear out or seize. 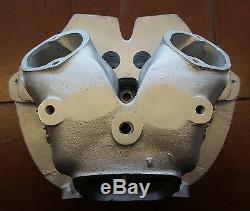 Inlet ports are 29mm and exhaust are 31mm. Valve sizes are 36.5mm and 34.5mm. For performance look in the vintage club archives for his race results especially Lydden. USED If You Wish To Make Any Queries About This Item Please Quote Item 3792. PLEASE NOTE All Of My Items Can Be Collected, However, Most Are Now Stored Offsite At Another Companies Premisis. I May Thus Require Up To 4 Weeks Notice Before Some Parts Can Be Collected In Person. OVERSEAS CUSTOMERS PLEASE READ I DO NOT RESTRICT MY AUCTIONS TO UK ONLY CUSTOMERS, HOWEVER, SOME OF THE ITEMS I SELL ARE OVER 2KG AND AS SUCH NEED TO BE SENT PARCEL POST WHICH CAN BE EXPENSIVE. 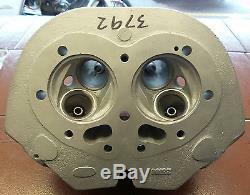 The item "3792 CYLINDER HEAD 650SS RACER CONVERTED TO FLANGE FITTING EXHAUST PIPES" is in sale since Tuesday, May 16, 2017. 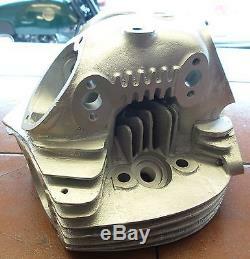 This item is in the category "Vehicle Parts & Accessories\Motorcycle Parts\Engines & Engine Parts\Cylinder Heads & Valve Covers". 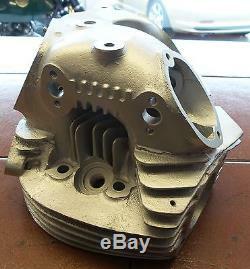 The seller is "norvilmotorcycle" and is located in Cannock / Lichfield. This item can be shipped worldwide.